TOPSoccer (The Outreach Program for Soccer) is a community based program that is designed to meet the needs of children and young adults that have physical and/or intellectual disabilities.The program is geared towards player development rather than to competition .The program is designed to bring the opportunity of learning and playing soccer to anyone aged 5 and older, who has a mental or physical disability. The basis of TOPSoccer is a modified version of the game of soccer, specifically altered to allow full participation and enjoyment for each athlete. What are the program’s benefits? 1. Development of motor skills and improved physical fitness. 3. Provides safe participation and fair play. 4. Develops positive self-concepts through experiences in discipline, initiative and achievement, which encourage children to fully realize their potential. Who is eligible for TOPSoccer? Any player aged 5 and older having a physical or mental disability that limits their ability to perform at the level of play they have chosen to participate. Emphasis of this program is on development, training, and providing meaningful participation rather than on competition. 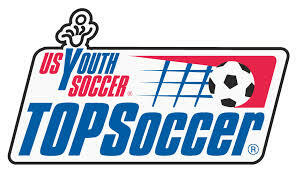 How is TOPSoccer Similar to Typical Soccer Programs?